Enretech has developed a Spill Response Kit specifically for marinas, related businesses and boat owners based on current environmental standards and codes of practice. These kits contain the necessary components to help the end users meet their moral and legal obligations in a controlled marine environment. KleenSweep is included to absorb and contain spills on hard surfaces, whereas Cotton Pads (Oil Only) are included for oil & fuel spills on water. The natural fibres in the pad repel water and allow the pad to remain floating – thus maximising its oil absorption and allowing easy retrieval. 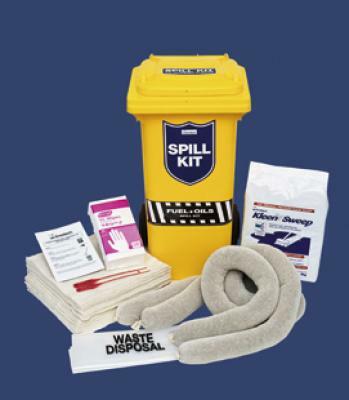 The Marine Spill Response Kit is designed to be carried in marine areas, to contain and clean up hydrocarbon (oil and fuel) spills — both in the workshop, as well as on the fuelling dock and in the water. Highly absorbent — each kit absorbs up to 140L of oil. Combines both pads & loose particulate for a quick & complete clean-up. No residues remain. Comprehensive solution — can be used on workshop floors, fuel docks, and on water. Kit contains a combination of Enretech sorbents, PPE and clean-up accessories.